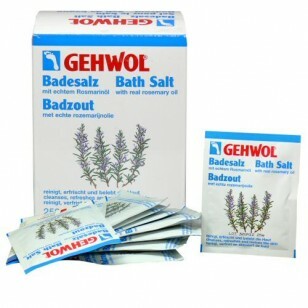 A foot bath with GEHWOL Rosemary Bath Salt softly and thoroughly cleanses, revitalises and strengthens the skin. The soothing ingredients including real rosemary oil are deeply absorbed into the pores and prevent excessive perspiration and foot odour. Directions: Dissolve 1 sachet in 4L of water. Can be used as a footbath and as a complete bath. Tip: Brush massages can be used in the bath to intensify the soothing effect.